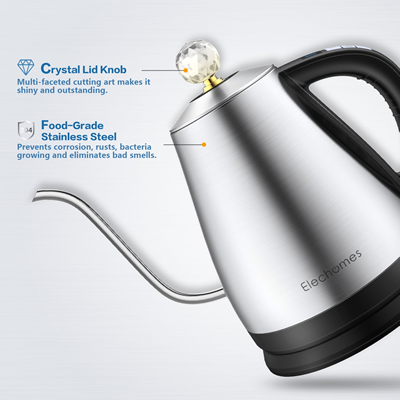 I always wanted to write a review about a gooseneck kettle with a crystal knob. 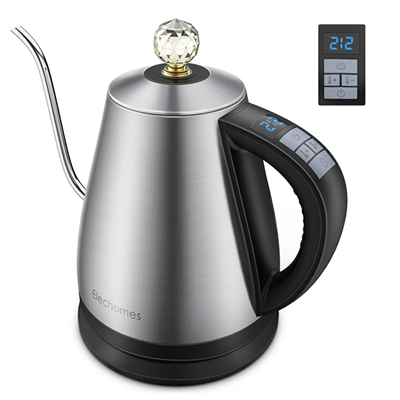 However, this temperature controlled kettle has a slightly smaller capacity (1.2l). It is made from high-grade brushed stainless steel and looks neat and elegant. Due to the smaller size, it is light and therefore easy to handle even when filled. The gooseneck spout contributes to the retro design but is also very useful for controlled pouring (see video below). You cannot see the water level from the outside but the boil-dry protection will turn off the kettle if there is no water in it anymore. There are 12 temperature settings, starting with 100°F/38°C, clearly shown on a digital display. 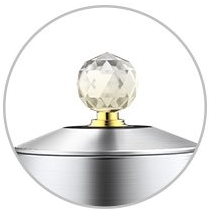 The most striking feature is, of course, the crystal knob. You can rub it gently and make a wish every time you turn on the kettle. If your wish were to boil the water, it would come true in just under 5 minutes. For all other wonders, please be patient. There are contradicting reports whether there are beeps with every action or not. It is not meant to make noises, but some models seem to include them. The temperature control is integrated into the handle and allows 12 settings. It starts with 212°F/100°C and can be decreased by 10°F increments to as low as 100°F/38°C. 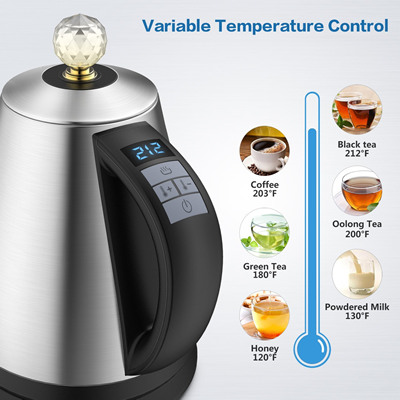 This covers all possible purposes and is the widest range of temperature from all reviewed variable kettles. As good as the brushed steel looks it get also very hot when the kettle heats up. Always use the handle and do not touch the hot metal! The advantage of a gooseneck spout is the very controlled pouring. This is crucial for an aromatic drip coffee – see video below. The disadvantage of the long thin spout is the loss of heat during the pouring. Probably not a problem for most users, but it is not desired for sensible teas. More features are listed here. Suitable for a $ budget. The Elechomes kettle is a funny fish. It starts with the Lord-of-the-Rings-like name, the compact retro design, long gooseneck and ends with a fancy crystal knob on the top. It doesn’t seem to know exactly what it wants to be. Apart from that, the functionality is superb and the price is fair. It is probably more suitable for coffee drinkers than for tea enthusiasts. Did I mention the crystal knob on the top? To go to the manufacturer’s website click here. Please also check out Affiliate Disclosure here. Please leaves your comments, opinions and experiences below. This is a super good article thank you so much for writing this, I like this goose neck kettle, it seems like it would be great for coffee in the morning. I will definitely need to try this out as i have been looking for a smaller one for my work space. I am glad i came across this thank you! a safer alternative would be the T-fal kettle. Funky design but doesn't get as hot as the metal ones. The Brevo glass kettle is another contender for the family kitchen. Almost therapeutic to watch the water boiling.